While we hesitate to admit that the summer (and creamy whip season) is over, the end of that last abysmal heat streak is a welcome change. Still, we need to drown our sorrows. Enter J-Petal. The new Japanese crêpe and Thai ice cream shop opened their first Ohio-based store in Clifton over the summer, and it’s worth your time. While savory crêpes are available, we suggest you head straight for the sweet ones. Impeccably crafted, each crêpe is delicately created, from the placement of the fruit to the drizzling of the syrup, and ultimately, the rolling of it all into a delicious bouquet. And no need to worry about the burrito-like experience of getting one topping per bite—J-Petal knows what it’s doing, and shows off with even distribution of the filling. (Not to mention, each crêpe comes in its own wire stand, so you can set it down without spilling.) Even after summer’s peak, the fruit is perfectly ripened with a crêpe just wispy and sweet enough to bring the interior together without overpowering it. But the real star is the Thai rolled ice cream. Choose from a variety of ice cream bases, toppings, and drizzled syrup to create the perfect concoction. (We opted for a chocolate and Oreo dish. Obviously.) 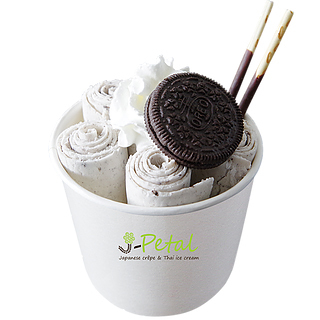 Once you’ve selected your base, J-Petal pours melted ice cream onto a large frost-covered counter, chopping the ingredients into it, working the ice cream over until it turns into a paste-like consistency, and finally spreading it thin and using a spatula to create ribbon-like curls. Six curls are placed into your bowl, which you then may top and drizzle as you please. So, does it taste different? For starters, you’ve got longer to eat it: The rolls only melt on the exterior, keeping the center of each frozen until you get to it. The texture is smoother and more consistent, despite having crushed Oreo inside, and the flavor is stronger and the ice cream less creamy. Which is to say, yes, it tastes different. And yes, it is delicious. Oh, and bonus: They use rice flour, meaning all their products are gluten free. If you try hard enough, you just might be able to convince yourself it’s a healthy snack. Next articleWhat’s Next For Downtown?